People have always needed to know the time and sundials were used long before there were any clocks. Even when clocks and watches had been invented, sundials were still made. In the past, clocks and watches were very expensive and few people could afford them, so sundials were put on houses so that everyone who passed by could see what the time was – assuming that the sun was shining, of course! 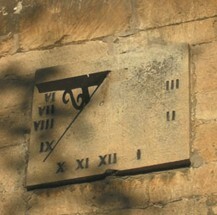 Campden High Street has seven sundials and there used to be at least one more. It is unusual for a town of this size to have so many sundials. 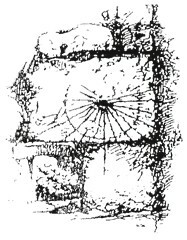 The oldest sort of dial, seen on the porch of St. James’s Church, is called a ‘SCRATCH DIAL’ or a‘ MASS DIAL.’ They were very simple and just showed the times of services so that the bell could be rung. A stick pushed into the hole throws a shadow. They may also be for practice and testing of equipment for setting up the sundials. This was when they needed to be calculated for the location (usually by the vicar or the schoolmaster) and then incised into the stone. The south-facing porch and one of the buttresses have mass dials/scratch dials. These gave the times of services but could fall into disrepair and needed to be renewed quite often. The stone into which they were shallowly cut could be weathered making them uncertain to read, the gnomon or style could fall out (usually just an iron nail stuck in at right angles to the wall that rusted away) or a newly appointed vicar could demand a new one according to his own calculations. Or the times of the services might be changed. 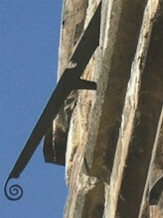 They were also used to show the moment when the church bell should be rung. So cutting devices were needed that could be rotated in circles. Practice pieces often involved intersecting curves – as in learning the use of some geometry instruments at school. One can imagine a skilled but illiterate craftsman making such curves under the direction of the vicar. Only when the vicar was satisfied that the workman could do the necessary work would he be allowed to produce the actual sundial. Nowadays people are so used to having clocks that they are unaware of the days when hours were unequal (12 hours daylight & 12 hours night all through the year!) and mass dials were the only necessary time- telling devices. This is one of the oldest houses in the High Street and was built over 600 years ago. 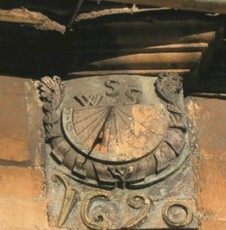 The small sundial is not so old – it has the date 1815. The gnomon has been set at an angle to point at the Pole Star. When it was made the numbers would have been cut into the stone and then painted so they could be seen easily. 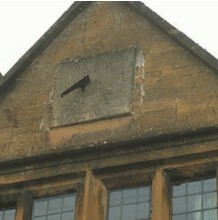 The house doesn’t face due south so the dial can only show some of the hours of the day. It shows the morning hours and the early part of the afternoon. 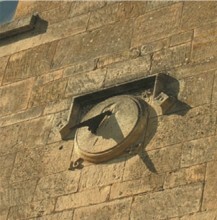 This sundial is set at an angle to the wall – set like this it would show more hours of the day. It shows most of the morning hours and the afternoon hours. It was a very accurate dial and was used until 1854 for checking and setting the Town Hall clock even though you can’t see the clock from near the dial –perhaps they shouted! This house has a vertical dial dated 1647. The gnomon has been reset in the wrong place which means that it does not tell the right time even though the hour lines can still be seen. This sundial has a gnomon emerging from a gold sunburst. Richard Miles, a well-to-do Campden grocer, built the house in 1815. We don’t know who made the sundial for him. This was the home and shop of the Warner family 200 years ago. They made and mended clocks, watches and sundials. 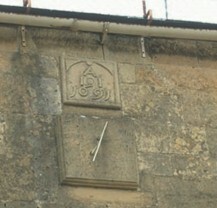 The sundial on the wall would have been used to set and correct these clocks and watches. The gnomon has been replaced but is it not in the correct position so it won’t tell the right time anymore. The curl at the end of the gnomon is just for decoration. All gnomons are straight so that they cast a clear shadow for telling the time – the curl doesn’t make a difference. These hours and figures are, unusually, in relief. 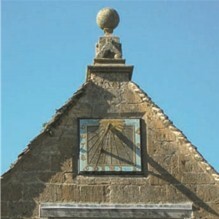 This is the last house in the High Street with a sundial. Maybe this is the real date when the house was built – 300 years ago. 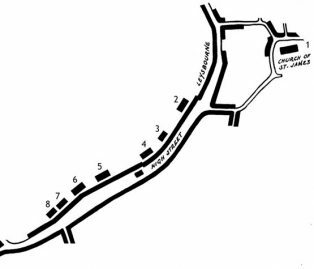 The text here has been taken from the CCHS Trail leaflet on Sundials which was compiled with the help of St James’ & Ebrington C. of E. Schools, copies of which are available from CCHS or from the Tourist Information Centre.